The organ, probably the oldest Pipe Organ in the Hunter Valley, was installed in the picturesque mudstone church of St Luke’s, Wallsend when the present building was dedicated and opened for worship in December, 1880. However it has a much longer and interesting history. 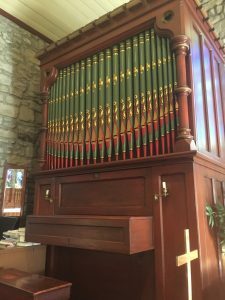 This historic instrument was built in London in 1855 by the prominent firm of J. R. Walker, Organ Builders and was brought to serve at St. Mary’s Church Maitland. 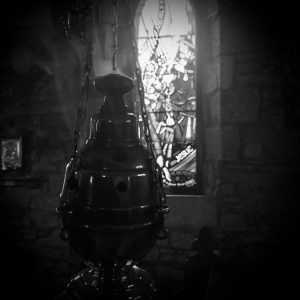 When the present St. Mary’s Church was built, a”grander” organ was required and this instrument was sold in 1880 for One Hundred Pounds to the Parish of Wallsend for use in the new St. Luke’s Church which was then being constructed to replace an earlier timber-slab building. The Organ was dismantled and shipped down the Hunter River from Maitland to Newcastle at a cost of twelve shillings and sixpence and, presumably, railed to Wallsend and installed in the new church. The organ has a “twin” in the Presbyterian Church at Mudgee, NSW. These identical organs were consecutive numbers in the Order Book of J. W. Walker. The twin was also brought to Australia to serve in the Anglican Church at Mudgee. However, a larger organ was later given for use in that church on the condition that the smaller Walker organ was transferred to the Presbyterian Church in Mudgee, where it still serves today. Both organs are tuned and serviced by Ian D. Brown and Associates, Organ Builders, who recently carried out restoration and repair of St. Luke’s wonderful and interesting instrument. The original wooden tracker action was restored, replacing aluminium rods installed in 1975 and the whole action improved. New Brazilian Rosewood and Ivory stop knobs, believed to be identical to the originals, were also installed. These replaced some that had been installed in the 1975 “restoration”.